Тема в разделе "СКАМ", создана пользователем All-HYIPs.info, окт 18, 2018. Наверное, каждый, или практически каждый человек рано или поздно начинает задумываться куда инвестировать накопленные денежные средства. Банки дают мизерный процент, и за частую он не устраивает инвесторов. Так что же делать, и где найти компанию. Такую же надежную как банк, но с гораздо большей доходностью. 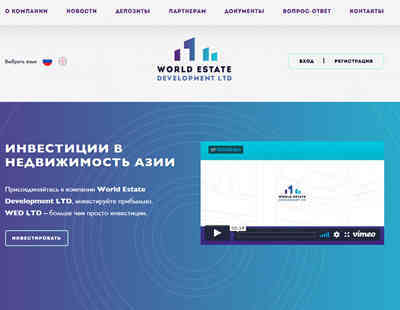 World Estate Development LTD именно такая компания! 10.17.18 13:28 Account Transfer -200.00 Sent Payment: 200.00 USD to account U18464399 from U1294xxx. Batch: 232468728. Memo: Shopping Cart Payment. 02.12.18 20:27;Account;Receive;Received Payment 40.00 USD from account U18464399 to account U1294000. Batch: 238339457. Memo: API Payment. Withdraw. 04.12.18 05:01;Account;Receive;Received Payment 2.1 USD from account U18464399 to account U1294000. Batch: 238473063. Memo: API Payment. Withdraw. 05.12.18 04:56;Account;Receive;Received Payment 1.6 USD from account U18464399 to account U1294000. Batch: 238586440. Memo: API Payment. Withdraw. 06.12.18 04:27;Account;Receive;Received Payment 1.6 USD from account U18464399 to account U1294000. Batch: 238691507. Memo: API Payment. Withdraw. 07.12.18 04:12;Account;Receive;Received Payment 1.6 USD from account U18464399 to account U1294000. Batch: 238796662. Memo: API Payment. Withdraw. 08.12.18 04:32;Account;Receive;Received Payment 1.6 USD from account U18464399 to account U1294000. Batch: 238898411. Memo: API Payment. Withdraw. 11.12.18 21:11;Account;Receive;Received Payment 10.00 USD from account U18464399 to account U1294000. Batch: 239291006. Memo: API Payment. Withdraw. 11.12.18 06:19;Account;Receive;Received Payment 1.6 USD from account U18464399 to account U1294000. Batch: 239201324. Memo: API Payment. Withdraw. 10.12.18 08:16;Account;Receive;Received Payment 10.00 USD from account U18464399 to account U1294000. Batch: 239094940. Memo: API Payment. Withdraw. 13.12.18 05:22;Account;Receive;Received Payment 1.6 USD from account U18464399 to account U1294000. Batch: 239413799. Memo: API Payment. Withdraw. 12.12.18 19:53;Account;Receive;Received Payment 5.00 USD from account U18464399 to account U1294000. Batch: 239390040. Memo: API Payment. Withdraw. 12.12.18 05:03;Account;Receive;Received Payment 1.6 USD from account U18464399 to account U1294000. Batch: 239308227. Memo: API Payment. Withdraw. 14.12.18 05:06;Account;Receive;Received Payment 1.6 USD from account U18464399 to account U1294000. Batch: 239509455. Memo: API Payment. Withdraw. 15.12.18 06:43;Account;Receive;Received Payment 1.6 USD from account U18464399 to account U1294000. Batch: 239606817. Memo: API Payment. Withdraw. 18.12.18 04:22;Account;Receive;Received Payment 1.6 USD from account U18464399 to account U1294000. Batch: 239875325. Memo: API Payment. Withdraw. 19.12.18 05:22;Account;Receive;Received Payment 1.6 USD from account U18464399 to account U1294000. Batch: 239986488. Memo: API Payment. Withdraw. 20.12.18 10:36;Account;Receive;Received Payment 25.00 USD from account U18464399 to account U1294000. Batch: 240111463. Memo: API Payment. Withdraw. 20.12.18 05:50;Account;Receive;Received Payment 1.6 USD from account U18464399 to account U1294000. Batch: 240087686. Memo: API Payment. Withdraw. 22.12.18 05:03;Account;Receive;Received Payment 1.6 USD from account U18464399 to account U1294000. Batch: 240277094. Memo: API Payment. Withdraw. 21.12.18 19:08;Account;Receive;Received Payment 5.5 USD from account U18464399 to account U1294000. Batch: 240252221. Memo: API Payment. Withdraw. 21.12.18 05:23;Account;Receive;Received Payment 1.6 USD from account U18464399 to account U1294000. Batch: 240183534. Memo: API Payment. Withdraw. 22.12.18 20:10;Account;Receive;Received Payment 10.00 USD from account U18464399 to account U1294000. Batch: 240346139. Memo: API Payment. Withdraw. 22.12.18 09:40;Account;Receive;Received Payment 15.00 USD from account U18464399 to account U1294000. Batch: 240294865. Memo: API Payment. Withdraw. 25.12.18 08:33;Account;Receive;Received Payment 1.5 USD from account U18464399 to account U1294000. Batch: 240535828. Memo: API Payment. Withdraw. 25.12.18 05:50;Account;Receive;Received Payment 1.6 USD from account U18464399 to account U1294000. Batch: 240525323. Memo: API Payment. Withdraw. 27.12.18 05:30;Account;Receive;Received Payment 1.6 USD from account U18464399 to account U1294000. Batch: 240696342. Memo: API Payment. Withdraw. 26.12.18 04:56;Account;Receive;Received Payment 1.6 USD from account U18464399 to account U1294000. Batch: 240605474. Memo: API Payment. Withdraw. 28.12.18 04:48;Account;Receive;Received Payment 1.6 USD from account U18464399 to account U1294000. Batch: 240781245. Memo: API Payment. Withdraw. 30.12.18 05:56;Account;Receive;Received Payment 15.00 USD from account U18464399 to account U1294000. Batch: 240933447. Memo: API Payment. Withdraw. 29.12.18 07:43;Account;Receive;Received Payment 15.75 USD from account U18464399 to account U1294000. Batch: 240866691. Memo: API Payment. Withdraw. 29.12.18 05:09;Account;Receive;Received Payment 1.6 USD from account U18464399 to account U1294000. Batch: 240859694. Memo: API Payment. Withdraw.